I’ve been thinking about doing some chargrilled halloumi for a while, and while researching it I stumbled on this recipe for za’tar encrusted halloumi. I had to look up what za’tar was, and in this context it’s a blend of sesame, sumac and other dried herbs used in Middle Eastern cooking. We’ve got sesame seeds lying around, and thought I’d try and pick up some sumac if Borough Market had any, but as it turns out they had za’tar at Spice Mountain, so I got a tub of that. Also at Borough Market there were some cheap asparagus tips, so I picked some of those up to go with basic peppers and onions for the veg. 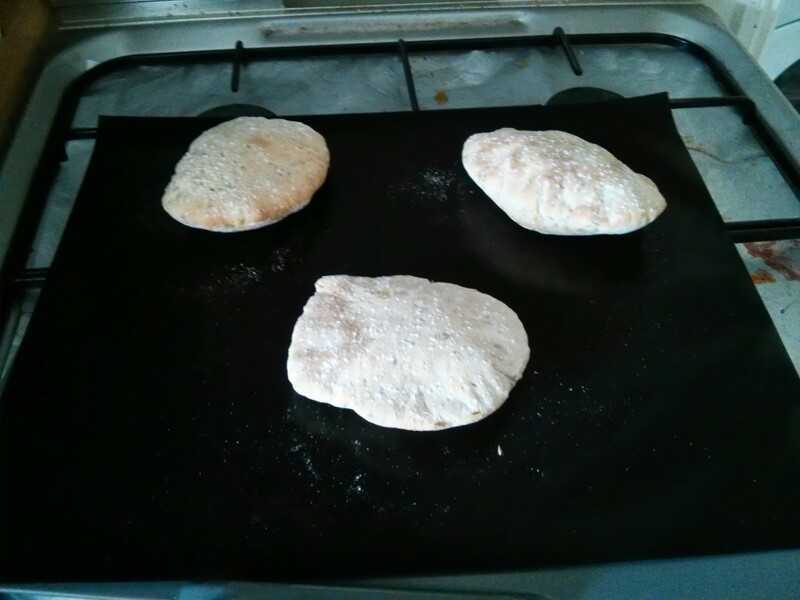 I’ve been thinking of trying making my own pita bread for a while, so decided to add that to make a meal. 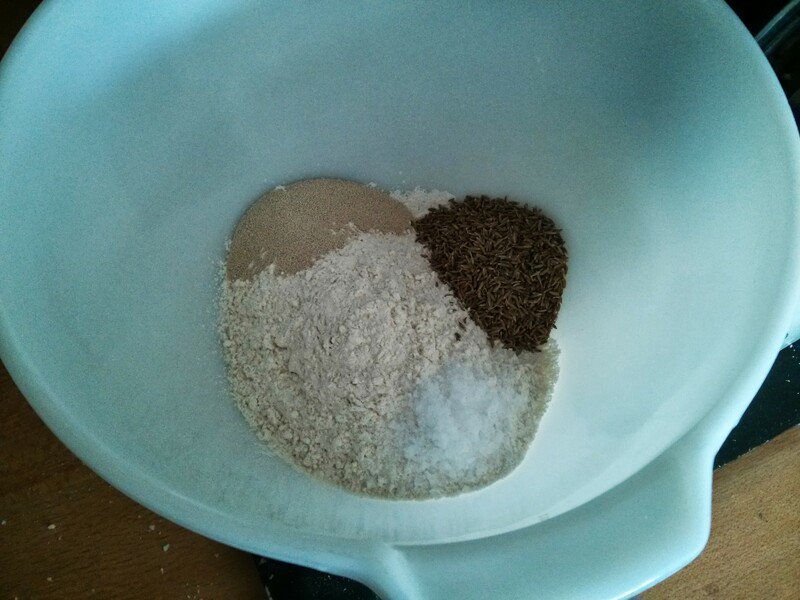 Paul Hollywood’s Bread book recommends mixing in some nigella seeds (aka onion seeds, although they’re not seeds of onions…) but we didn’t have any of those, and nor did the local shop. So Soph suggested using some cumin seeds (jeera) instead. 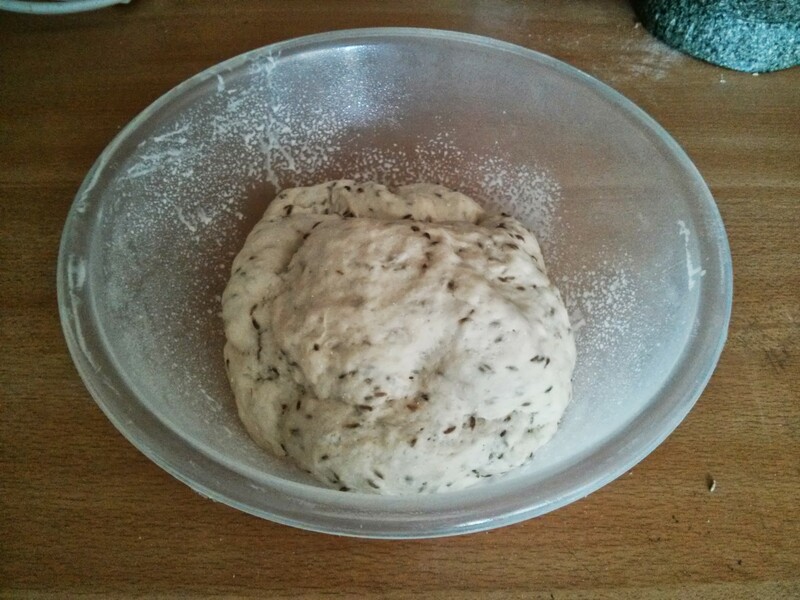 Once the mixer has done the hard work of kneading the dough it’s off to rise for an hour. I remembered to spray oil on the cling film this time, so no issues with it sticking for a change! 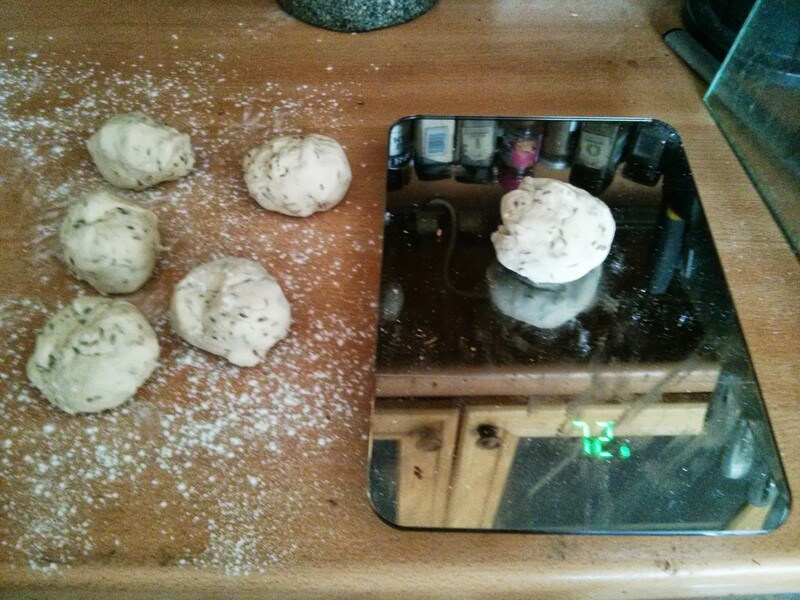 After rising I gently fold the dough a couple of times to knock it back, then split into six balls. To make sure my balls were even I weighed them! 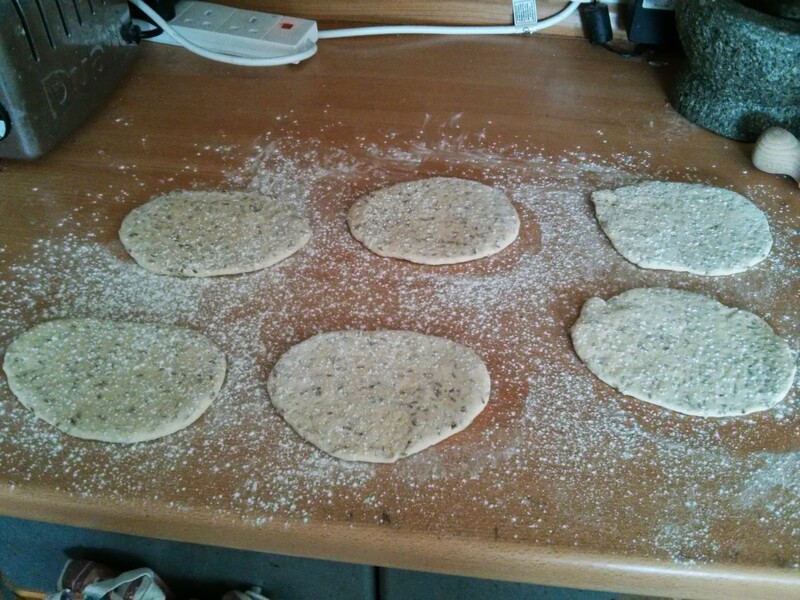 These get rolled out into oval shapes and covered on both sides with flour. Meanwhile the oven has been heating to its maximum temperature, and baking trays lined with teflon baking sheets have been inside warming up. Hollywood’s recipe says cook for 5-10mins… which is a pretty big range for such a short time! 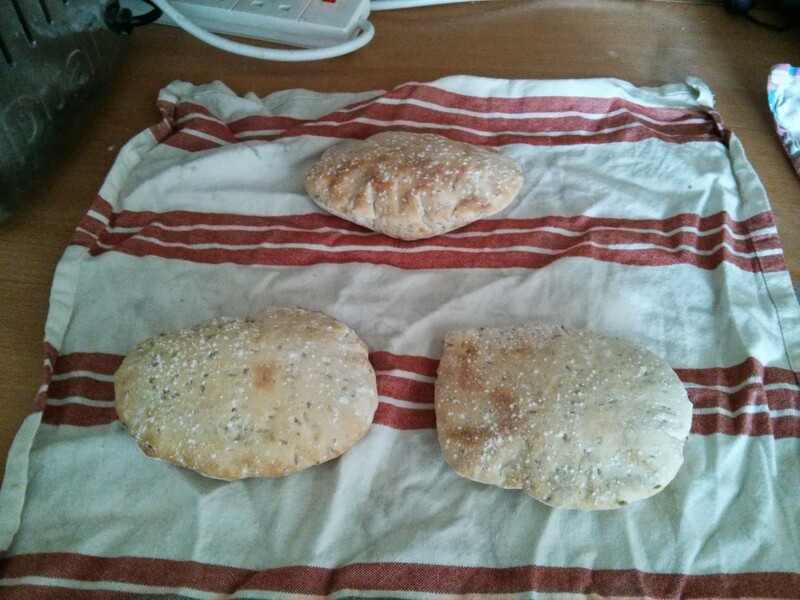 I went for 7 minutes and was pleased to open the oven to puffy pitas that were just taking on some colour! These then got wrapped in tea towels until we were ready to eat. 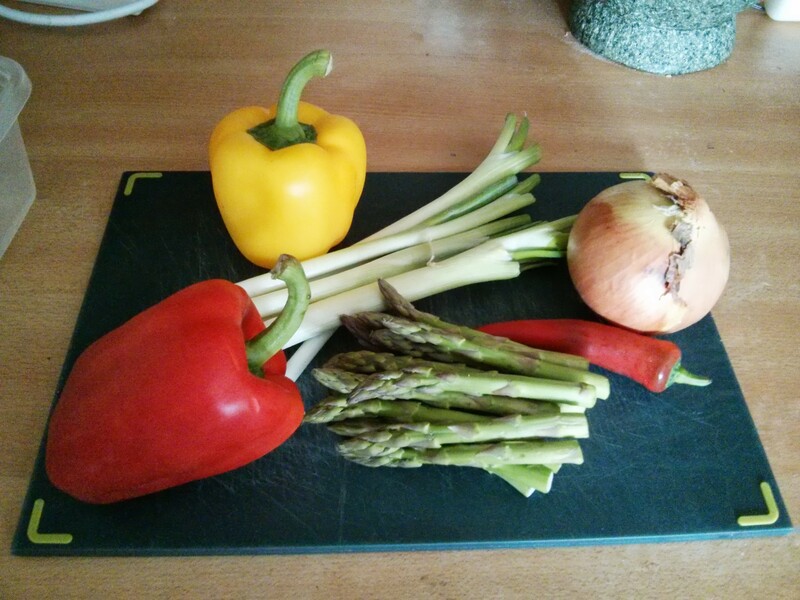 For the veg I found a couple of peppers, some spring onions, a chilli, a white onion and the asparagus. I microwaved the asparagus in a covered bowl with a dash of water for 3 minutes while I chopped up the rest of the ingredients. Turns out that was over cooking it, 2 minutes just before trying would have been better. Onto the halloumi, which was lower fat with tomato & garlic. 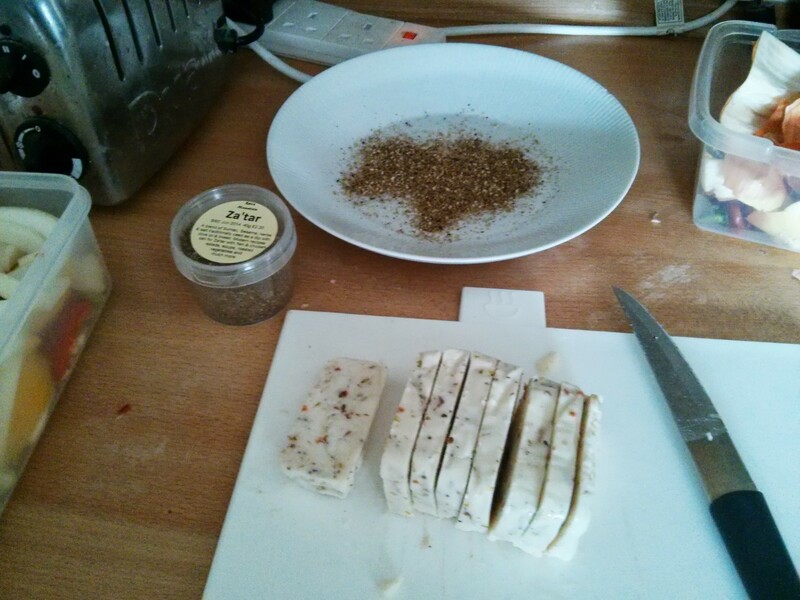 I sliced up the halloumi and rolled it in the za’tar spices. 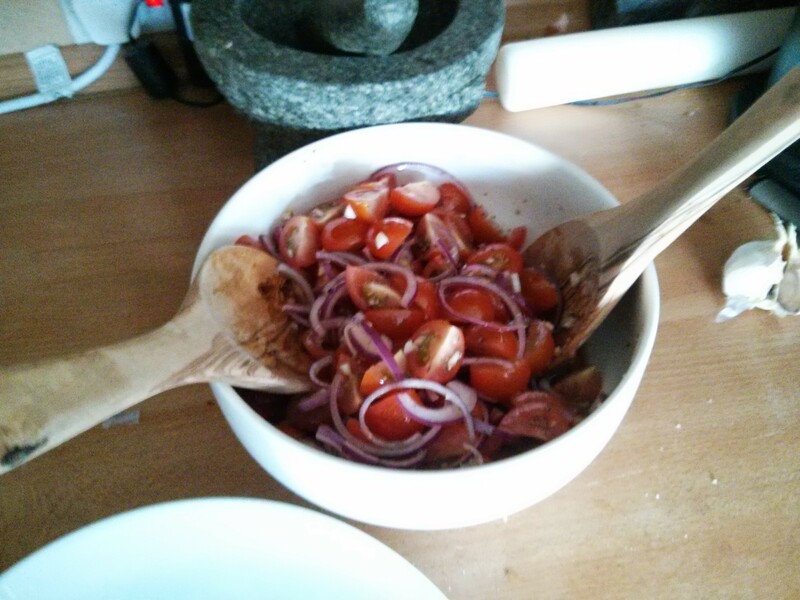 While I was doing this, Soph was making a tomato salad with red onion, garlic and some extra virgin olive oil. So, mise en place, I’m ready to cook! 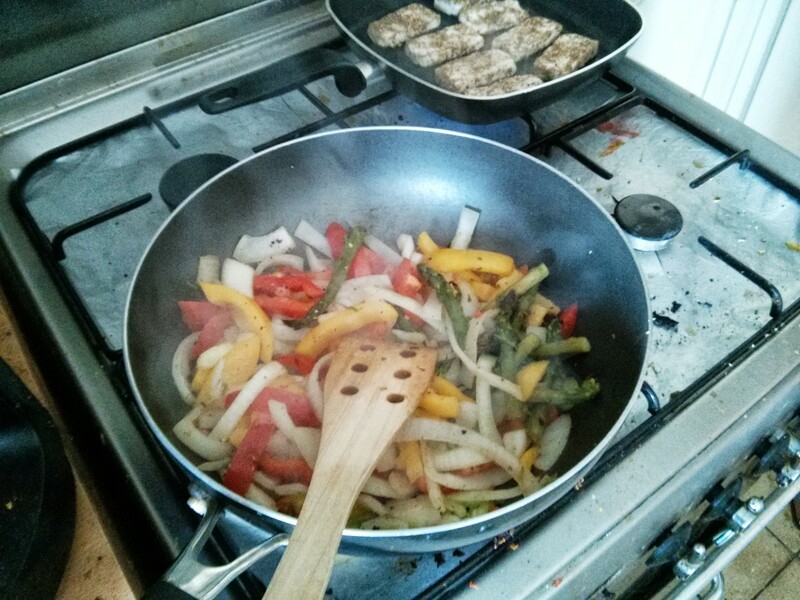 The veg gets stir-fried with salt, pepper & piri piri seasoning. 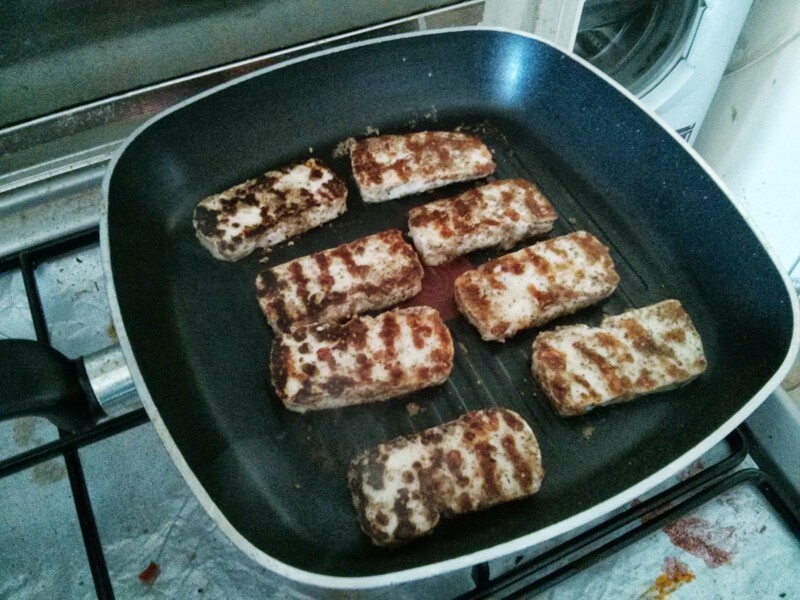 The halloumi goes in a hot griddle pan for a couple of minutes on each side. Then it’s time to plate up and eat! What a great lunch! 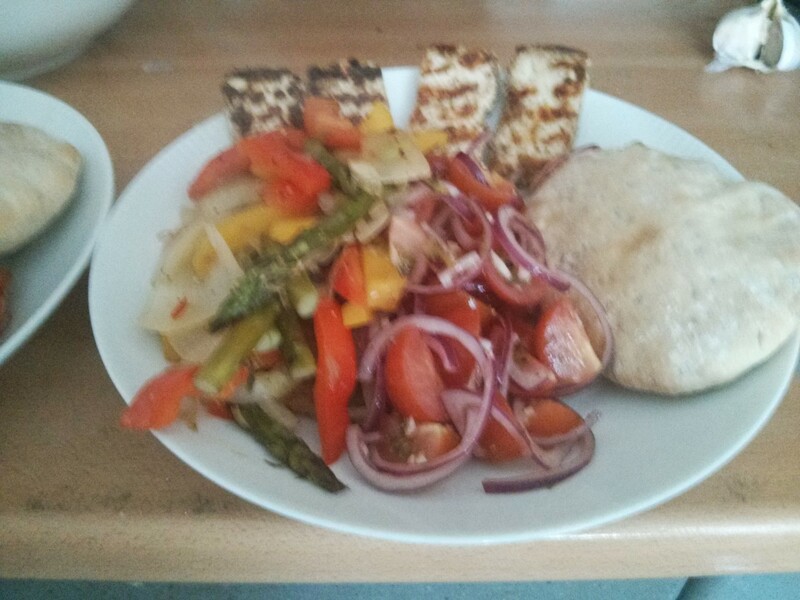 The za’tar spice is quite gentle, but it really works with the halloumi and tomato salad. 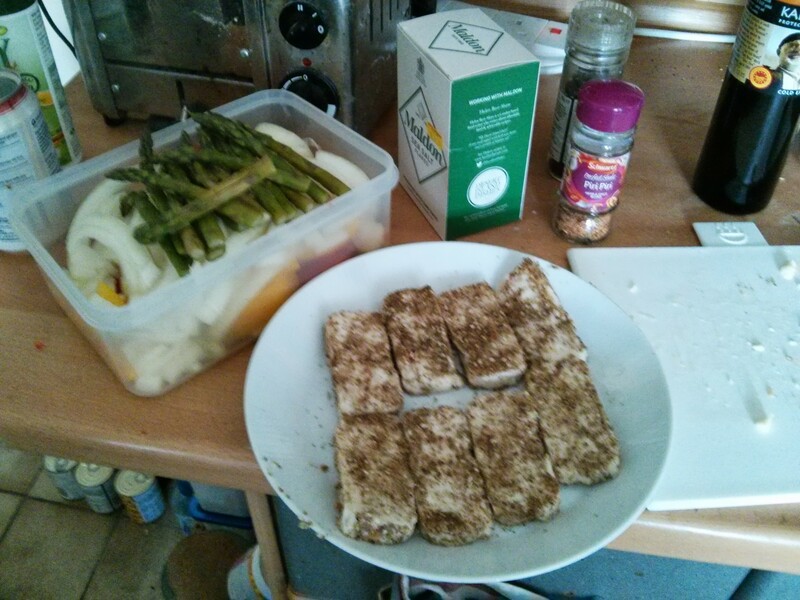 As I mentioned the asparagus was a bit over cooked, but the peppers and onions were nice and crunchy. The star of the meal, however, was the flavour of the pita bread. I was pleased to see they’d puffed up and had nice pockets inside, but it was the warm cumin flavour that made them amazing! When I read the title of this meal, I hadn’t got a clue what it was – all new names to me – which just goes to show how “provincial” I am. Looks interesting though.